I was recently asked how I deal with wet things in a Prius. Dealing with wet things is no fun in a humid climate regardless of it being my Prius or the Class B that I had. The problem is the moisture getting into the inside air and when the temperature drops at night condensation becomes a problem, especially on the windows. When I am ready to drive off in the morning I need a dry hand towel to wipe the front windows and it is soaking wet when I am done. Having this much moisture inside my Prius is not good for stealthing as the moisture is visible from the outside of the vehicle and is a telling sign of something is different with this vehicle. 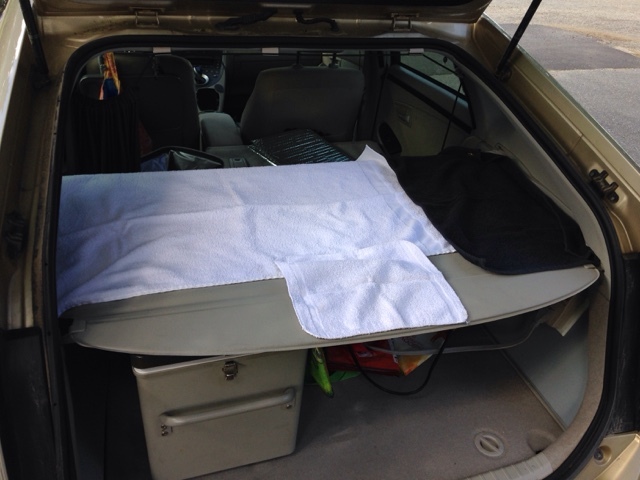 One of my recent posts on bathing in the Prius I neglected to say what I do with the two wet drying towels and wash cloth after washing. I recommend in places of higher humidity and when the temperature will go down to the dew point is to put the wet towels in a plastic bag overnight until the next morning when the higher temperatures allow moisture to evaporate into the warmer air. I leave my privacy cover in the back in my Prius living design as it is great for hiding my sleeping area and fridge. It is vinyl so I lay the wet towels on top of it during the day to dry, as seen in the picture above. Note I only use small thin towels not heavy bath towels. I do this for two reasons. First is space. My towels take up little space. Also they drive fast. I carry two bath towels and two face cloths and a hand towel for my lap when washing my hair. This way if my towels are dirty before I wash, I have a second set to get through the week. Have you ever tried wiping dawn on the inside of the Windows for condensation? I have not tried Dawn. I doubt it will prevent condensation forming on cooler surfaces as the dew point is reached. Condensation is something that all Vandwellers have to plan for and deal with. Thanks for the video link on the Dawn soap usage. I'm always open to try new things so I will try it in the future to see how it works.